Here’s an idea that came from a student at The Arden Centre a good few years ago; I think his name was Ben Shaw. Could’ve been someone else though. Anyhow, there was a tune that had a couple of chords, perhaps like the chords above, that were from two different keys. I was explaining that you could use the arpeggio or the scale to highlight the sound of the chord. Making the changes stuff. Then he says, ‘why don’t you mix up the notes to get one scale that fits both chords’. 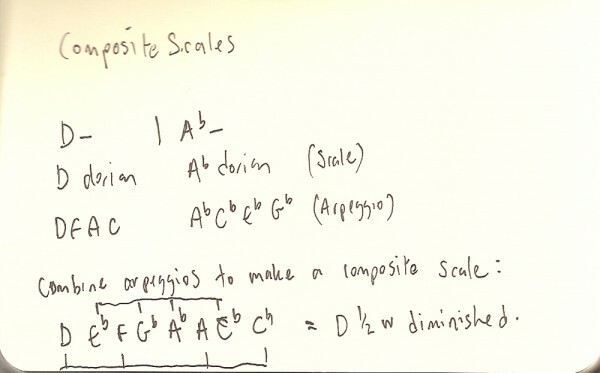 So here, you take the 7th chord arpeggios of D-7 and Ab-7 and arrange them as a scale, and that gives you the D diminished scale. E.g., C Ab E gives you triads of CEG, AbCEb, EG#B. Arrange that lot in order and you get: C D# E G Ab B, which is the C Augmented scale. If you come up with anything that’s nice, feel free to keep it to yourself and don’t share it in the comments box below AT ALL. Don’t do that, because I will steal it, just like I did this chap’s idea from 20 years ago, and post it here on the Internet and take ALL, YES, ALL THE GLORY!